CopyQ is a completely free and open source clipboard manager which provides a ton of extended functionality to the Windows Clipboard. With CopyQ, all you have to do is copy and paste as you normally would and the program will save what you have copied in a history which is accessible from within the program, accessible from the system tray. The program also allows for searching clipboard activity and can even edit entries. 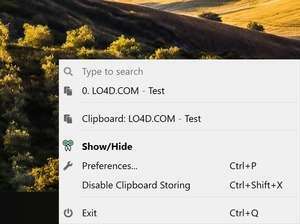 Clipboard items which are no longer needed are easily deleted. For security reasons, you should also check out the CopyQ download at LO4D.com which includes virus and malware tests. Additional screenshots of this application download may be available, too.